Interrelated links of deep and superficial veins exist in the foot. The deep veins trail the arteries. Over the metatarsals, superficial veins channel into a dorsal venous arch on the dorsal surface of the foot. The great saphenous vein emerges from the medial aspect of the arch and then travels anterior towards the medial malleolus and over the medial aspect of the leg. The small saphenous vein begins from the lateral part of the arch and then travels posterior towards the lateral malleolus and over the back of the leg. The great saphenous vein is found in the superficial fascia and is the longest vein of the body. It is also referred to as long saphenous vein. Communicating veins among small saphenous and deep veins. Posterior arch vein – It collects the blood via the posteromedial part of the calf and also begins as a series of small venous arches linking the three medial ankle-perforating veins. 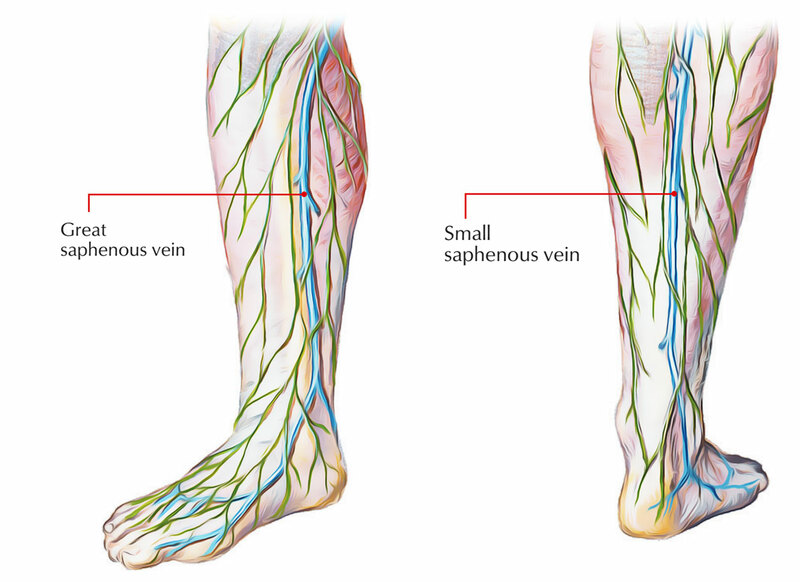 Anterior veins of the leg – They connect with the great saphenous vein and extend diagonally from the shin. From the calf, some veins connect with the small saphenous vein. Anterolateral vein – It starts in the lower part of the front of thigh, travels through the apex of femoral triangle, and afterwards in the upper part of the thigh, connects with the great saphenous vein. Posteromedial vein (accessory saphenous vein). These veins accompany the corresponding superficial branches of the femoral artery. Just before the termination in the femoral vein: the blood from the anterior part of the perineum is channed by the deep external pudendal vein. Later it turns interiorly in order to terminate into the popliteal vein. While going deep to superficial, the posterior femoral cutaneous nerve goes along with the upper part of the vein. The small saphenous vein has 7-13 valves. The dorsal venous arch is located at the distal parts of the metatarsal bones. There are medial and lateral marginal veins, which drain both of the dorsal and plantar parts of the specific sides within the dorsal venous arch alongside the foot. It interacts along with proximally situated dorsal venous network and receives the dorsal digital as well as dorsal metatarsal veins. (i) Medial portion of dorsal venous arch receives dorsal digital vein via medial side of the great toe and is extended as medial marginal vein. (ii) Lateral portion of dorsal venous arch gets dorsal digital vein through the lateral side of the little toe and is extended as lateral marginal vein. 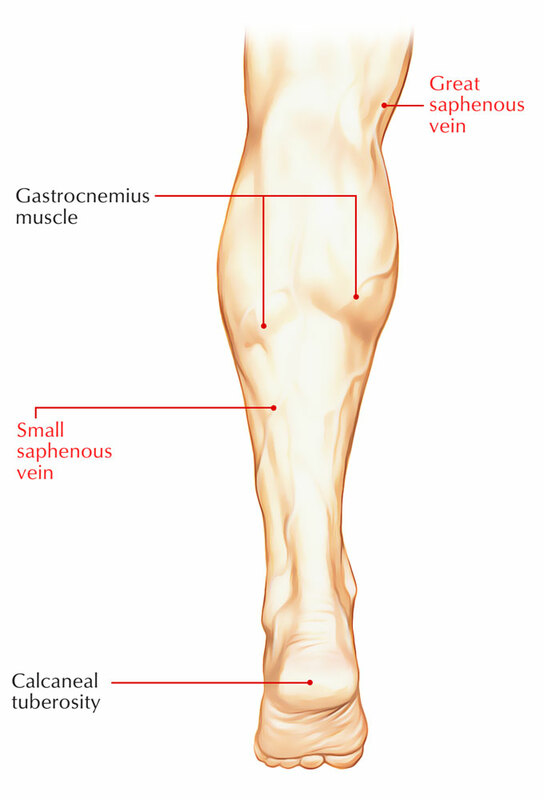 Small saphenous vein: drains blood via the lateral dorsal venous arch along with posterior leg (calf) within the popliteal vein posterior towards the knee. Great saphenous vein: drains blood via the medial dorsal venous arch, leg, as well as thigh within the femoral vein just inferior towards the inguinal ligament.